Inside are 20 flavorful NPCs to use in your 5th edition campaign. Each is given their own personality, quirks, and memorable features to help gamemasters bring them to life. They can be interesting faces in town, potential allies to aid in adventuring, or villains of their own - the choice is up to you! Individual art files of each NPC are also provided. 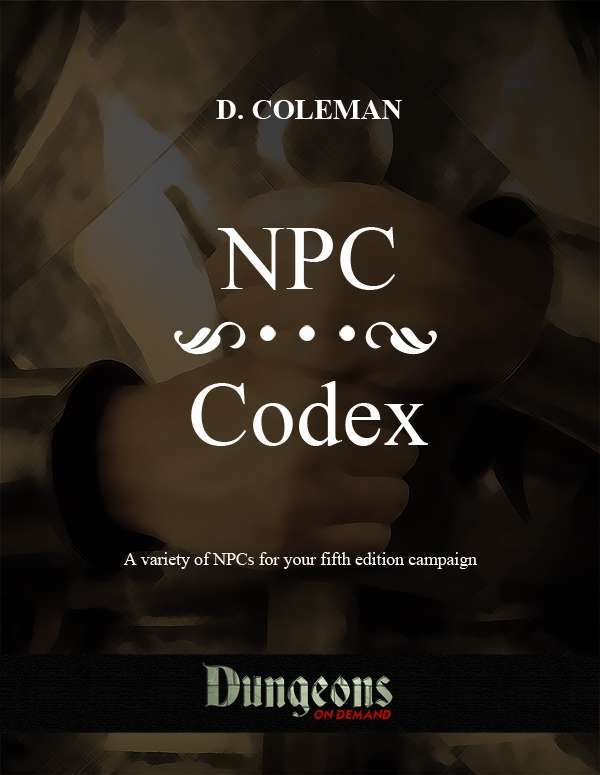 The NPC Codex is part of Dungeons on Demand: Volume Two. Dungeons on Demand is a line instant dungeons you can drop into your campaign, each is designed for 4-5 player parties of specified levels, and each dungeon is complete with a back story, hand drawn maps, traps, puzzles, and reference information to monsters and treasure. You can customize each one to fit in your campaign however you wish, and each one can be played through in one or two gaming sessions. Dungeons on Demand is not affiliated with Wolpertinger Press or Dungeon-on-Demand, but you should definitely check them out! Author Dan Coleman has been a Dungeon Master for two decades now, first picking up the dice with second edition. He can tell you what THAC0 stands for, a first level fighter's saving throw against rods, staves, and wands, and why players get excited to find "Treasure Type H."
Since then he's been through every new edition, and has written custom classes, spells, items, adventures, and system mods for each. By day he's a humble graphic designer and illustrator, but by night he's a full time role-player and game designer. This title is included in Dungeons on Demand: Volume Two! Do you like Dan's work? Check out MajiMonsters, a monster-catching, fantasy RPG! This title was added to our catalog on August 20, 2015.